I am a games programmer and indie games developer, currently living in Stafford. So on twitter, I telling people how I didn’t really have much time to take part in Ludum Dare. Turns out I did, but less than 24 hours, and for whatever reason I decided to experiment with the Nape Physics Engine. What I can say is that it’s a suprisingly easy engine to use, thanks to HaxeFlixel’s wrapper functions and Sprite class. I figured for the theme “One Room” what would be the worst room to be in, and figured the toilet. Hence, in Danger: Mondays, you are trapped in the porta-loo, balancing on a steel beam above while the wind blows and some kids throw rocks at you. So far I’ve managed to receive 84 votes, and some really great comments. There are still a few hours left, so why not give a bullet hell a try? Do people still do these? Here’s mine anyway, I like seeing these because progress is fascinating. Go play & vote on Spinstar HERE! So whatever reasons of this, I’m still taking part in this LD, even if it’s number 34. Whether or not the incidents above are the cause of an actual curse, I still enjoy the learning process and hard work I put into making small and quick games every year. 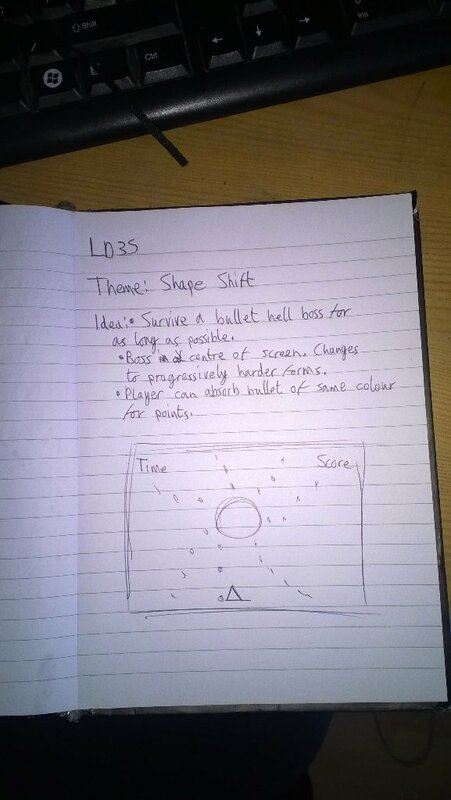 I look forward to seeing what cool stuff gets created and I hope, despite already having a planned trip to London…Ah well, going to London to see friends during a Ludum Dare didn’t stop me at LD31! Late for the Show is what I consider an unusual achievement for me, I have now taken part in six Ludum Dares, as well as other game jams that take place in 48 hours and some that last a week. However in this case, I wasn’t sure if I could manage to make something in time because of other plans, not to mention already finishing a game for #gbjam a week prior. However, from around 9PM on 22nd August to around 10PM on the 23rd, I managed to complete Late for the Show and submit it to Newgrounds and Ludum Dare. While I’ve had a few comments with criticisms about the game’s controls and difficulty, I’ve had several comment praising the graphics, audio, the intro and other aesthetics. Plus it’s currently sitting at 3.32 stars on Newgrounds. There was some slight inspiration to this, since I have woken up on occasions to the realisation that I need to leave as soon as possible to travel somewhere, so I have to quickly grab all the things I need and would sometimes forget something. To fit with the theme, I also decided to include the story of the player being an costume actor, so you need to collect your costume to go to the theatre. First off, some of the appraisals, to those who said they really like the graphics, thank you. All the pixel art was done with the aide of Piskel, the online pixel art and animation tool. I’ve been using it since GBJAM 4 and it’s been great to use. I like how you can manage your palette, compare frame by frame, mirror draw and do it all online and offline by saving via browser. I do wish it had more options when selecting sections, since you cannot select and area and drag it by hand. I hope people liked the designs of costumes, I’ve already drawn a few more that I can add in future updates. For those who like the music and sound effects, please send your appraisals to my best friend Lyserdigi, who accepted when I asked him for some retro music for the game on Sunday afternoon. He’s a professional and went through a lot of effort for the track, I think he even bought some sound packs for Elastik in order to achieve the 80’s retro effects of the track. The effects were done with the good old BFXR, a brilliant asset for temporary sound effects. Also, thanks to those who like the intro. I wanted something that is simple and clearly describes the in-game plot, and some humour. It was really satisfying hearing some comments from Ludum Dare and Reddit saying they loved the intro and found it funny. One of the criticisms made for the game was really short and only took place in one small room, while it would be easy for me to blame that on time, it was also my intention to set the “find the costume” part of the gameplay in a small room, because I wanted to give the setting that the player recently woke up and left everything in his/her bedroom. However I do really like one Twitch user’s recommendation of expanding the levels into several rooms and extending the time, giving more room to explore and possible hiding spots. I’ve also had a some issues in early playthroughs of the game, there was an issue with how you check items. Originally, due to how collisions work in HaxeFlixel, you had to be walking into items while pressing the check buttons. This was really difficult to make clear so before the jam deadline was up, I quickly made a build that included a box collision function that allowed the game to handle the collision between the player and objects, and check if the player is still nearby. It’s not perfect since I had to reposition some objects to avoid some conflicts, but at least you were able to check an object without going through it. If I had some time I’d like to expand on this game with some of the comments made, it would be great to make a larger game with the idea of being late and having to rush to your destination. 24 queries executed in 0.118 seconds.